Google asks Android developers to make next generation apps compatible to latest Android versions and 64-bit by August 2019 as a part of improving safety and efficiency of Android apps. Along with this, Google wants all new apps to target on Android Oreo or higher, by the starting of August 2018 and by November 2018, all existing apps should be changed to the latest versions. Developers who wish to keep the 32-bit apps can do so, but will also need to have the 64-bit version. Google reveals that the changes are intended to prepare developers for a time when smart phones only support 64-bit. According to Google, currently 40% of the latest Android devices support 64-bit while also being compatible to the 32-bit version. Google want developers to follow this as a bid to reduce fragmentation of the Android user base. Other than this, Google is also trying to push the enterprise customers to use the new Android device API’s. Let’s begin with an important question. Do you still wait to reach home and turn on TV to catch-up the latest scores, updates, news, TV shows? Or do you still rush to stores to do shopping, go to the bank to make transactions? Perhaps, we all hardly perform any of these actions and that’s because mobile apps can deliver all that you want on the go. In this era of competitive business, all industries need to include latest technologies. As technology plays a vital role in promoting businesses, no matter whether you are associated with a start-up, medium/big sized enterprise, its important to promote business in a better way to get more reach. Therefore companies are looking to lift up their brand name and revenue graph by using mobile apps. If you don’t advertise your business properly, then it would be difficult to survive in the market with tough competitors. With a highly-interactive mobile apps, you can always stay connected with clients and provide users, complete information about your services. Google has officially taken the wraps off its second-generation high-end devices, the Pixel 2 and 2XL. The Pixel 2 comes with a 5-inch screen with 1920×1080 pixels while the 2XL has a 6-inch display with 2880×1440 pixels. On the hardware side, Google has added a top-of-the-line Qualcomm’s Snapdragon 835 processor, 4 gigs of RAM (64/128 gigs) and the devices is water and dust resistant. Both the Android Oreo devices are comprised of OLED screens which offer a more dynamic visualization, use a single 12.2-mega pixel lens, front-side stereo speakers and has a fingerprint scanner calls imprint. An extra feature added is the squeezable sides, that can be literally used to grip the sides of your phone tightly to activate a short-cut or to launch a specific app. The new Pixel 2 has three colour variants- Kinda Blue, Just Black & Clearly White, and the Pixel 2 XL have two variants White & Just Black and Black. Finally, with the announcement of the Pixel 2, its time to see how the best phones from Google, Samsung and Apple head to top the mobile market. Like most other modern businesses, logistics industry is continually transforming and evolving to meet the new technological demands. To earn loyalty of customers, its important for logistics companies to transact business on any device, anywhere and any time. Becoming more secure and unified, mobile apps provides a multi-channel experience across web and mobile. To keep pace with the market, you need make use of apps that enable greater transparency and efficiency. What do Logistics Apps Generally Help With? Perhaps, the biggest advantage of using logistics industry apps is its ability to deliver cargo and receive data in real-time to both the employer and the customer. Here, mobile apps can be used to store valuable data and records that will be useful for further business decisions. In this competitive field of logistics, basic industry standards are increasing in areas of allocating stock, order management, lead times and much more. Without innovative digital solutions, such tasks would be left behind. Use of mobile apps can make things easier which carries out functionalities such as billing, accounting, and regulatory reporting tasks. In addition, paper waste can be eliminated, manpower is reduced, and human errors is diminished to an extend. Which in turn will improve profitability and thus enhance the overall business. It integrates seamlessly with existing systems and uses messaging services based on industry standards. Users can easily and continuously adapt to apps to keep pace with changing business and market requirements. GPS technology can be also incorporated to this which is to be done using the location based services which are provided for the people who owe to use this service. Shipment Tracking: This feature provides informations on log carrier, delivery of goods and track the shipments. • Consist of the entire catalogue of all representative offices for product delivery with full lists of telephone numbers and work schedules. • Latest information about the company, information on new services etc. For an industry like logistics which is on a constant move, mobile apps is an essential choice and plays an important role in ensuring real-time, consistent and accurate data. Building a secure, scalable mobility infrastructure will not only help industries but also earn trust of customers of getting shipments on-time with perfect condition. With increase in smartphone usage in the last few years, people seem to rely on mobile apps for anything from placing queries to purchasing things. However, most SMEs think of adding mobile app development as an extension to their business as a luxury, not realising the opportunities they offer. Market Demand For Mobile App Developers Will Grow by 2017: Gartner, Inc.
SMEs are always in search of a way to develop their business and the best way to do that is through customer engagement. Increased customer engagement means growth in orders and sales. It is the digital era and most of your customers may be online. Therefore, through a mobile application, you can inform your customers about your latest business offerings. You can also combine your marketing and social marketing strategies to stay connected with your customers through mobile app development. A mobile app development is the best way to build brand awareness and recognition. A well- developed mobile app devoid of bugs and other defects and loaded with engaging features will surely catch the attention of customers leading to increased brand recognition. Mobile app builders are coming up with new trends almost every day. Therefore, if you don’t keep yourselves updated about the new app trends, you may lose customers. This in turn compels you to adapt to the new trends and build an outstanding app with the best features to attract customer’s attention. With a mobile app it is easy to provide better customer service. If the people using your app are happy with your service, they will surely turn into your regular customers. Also, there are chances of good word-of-mouth referrals attracting more customers to your business. With mobile apps, it is easy to market and communicate to the particular group of people your business aims at. With new products, services, features and privileges available at their fingertips, customer engagement will definitely increase. A well designed mobile app can be used as a tool to develop your business and generate new leads. The aesthetically pleasing, defect-free and engaging app with offers and promotions can attract new prospective customers. As a SME business owner, you may not have a mobile app builder in your team. If you do not plan to hire any in the near future, you can just connect with an app development company or a mobile app development agency to help you build a mobile app for your business. Mobile applications have given a boost to the travel and tourism sector. The existence of apps in present days has transformed the experience of travelling completely. You can get quick online travel arrangements done at your fingertips with mobile apps – MakeMyTrip, Yatra, etc. They provide options for planning travel, finding agents, booking tickets, reservation of hotels and route mapping. According to a recent survey by eMarketer, travel-based mobile apps are the seventh most downloaded app category and almost 60% smart phone users, including iPhone and Android users regularly use travel apps to plan trips. People explore their destinations all alone at times at their own kind of pace Gone are the days when travellers relied on agents for making travel arrangements. Guidebooks, compasses, maps and other printed stuff have been replaced by travel apps that come loaded with different functions. Travel biggie’s such as MakeMyTrip, Yatra.com, Expedia, Gobibo.com etc. succeed consistently in drawing customers by offering attractive deals, coupons and vouchers on their apps. A mobile app will help you reach your customers 24/7 to provide them the best facilities. Another app introduced by iOS, known as “TripScout” gives you the flexibility to explore destinations all alone and at your own particular pace. This application allows you to discover and investigate new neighbourhoods, eateries, social sights etc. The best part is that you don’t need a guide or a manual, which spares you a considerable measure of time. You might forget a map, ticket, or a lot of other things. But, a smart phone doesn’t get forgotten easily. This makes a smart phone the best thing to have on a trip. The Google Play Store and Apple Store are flooded with travel apps to make your tours simple and stress-free. Transportation: The way you get to your destination is the most basic thing in planing a travel but, the important part is planing. It is imperative that any company providing transportation (flight, bus company, train etc.) has a highly functioning app in order to indicate all essential information to the customers about the directions, stops, prices, regulatory facts, etc. Destination Apps: Cities, Regions and Countries, can take advantage of travel apps to show potential visitors that what makes them so special by showcasing aspects such as sceneries, unique traditions, and general culture. Convenience: An app features the best hotels, restaurants, pubs, etc. that can be used by tourists searching for accommodation, entertainment recommendations, as well as by locals hoping to discover new restaurants in their area. Events: Apps can keep users updated with all information regarding upcoming events and simplify their lives by allowing them to register and buy tickets from their mobile phones, if necessary. Hotels & restaurants: Hospitality industry use various methods to develop and maintain an effective marketing plan. From the location to facilities and perks, companies should be sure that they’re providing what buyers are looking for. Entertainment: Entertainment and leisure activities are always top of the list when people plan their tour. Casinos, pubs, bars, discos, clubs, cinemas, concerts are often reasons for travelling. Most hotel accommodations these days have also inculcated entertainment shows as a part of their programs to spice up and entertain hotel guests. Gone are the days where tourists take the first deal they find. Social media and apps has seeped its way we look to travel, enticing online users make trips more personalised experience. Certain brands have options where you can work together with the travel experts on how to get the maximum out of the destination you prefer. Either you can choose packages provided or can add extra optional services. Every travel brand works hard to please its customers. Identify the key customer needs for product and communication. Brands must tailor their offers to customer interests with content and pricing that is specific to the customer’s travel need at hand. With travel apps you get soft copies of travel brochures, invoices and receipts, tickets, book hotels and even do passport works. It can save your time, reduces labour and resource cost and guide you 24/7. Travel companies can use apps as a way to streamline transactions and provide customers with quick and easier e-commerce experience. This can make the company’s work easy and also provide peace of mind to the traveller knowing their accommodation information- confirmations, itineraries, boarding passes, etc. and will be housed electronically for easy access in the future. Being available 24/7 show high responsiveness. You can provide these services through different methods like live chat through your website and real time online support. This will indicate that your business is receptive to their needs and is well available to help them out. Mobile applications can give an improved user experience easily as they can have all the things a person needs in one packet. Ranging from booking tickets, hotels and finding food destinations there, everything could avail in a single app. Apps increase the user base, as a whole new stream of people enters into the pool of customers. This in turn raises revenue and people added prove to be more loyal to the business. Integration of services like banking payments, hotel bookings, information about shopping streets and food corners can help a travel website expand and grow well in the market. This is possible when these services are combined and packed in a single app which is easy to download and use. Using such mobile apps, businesses are open to pushing notifications about the new deals and offers. This can excite a user and involve them more into the mobile apps. Every business nowadays has an application for it and not having one for your business may lag you behind. On the other hand, if you have a well-developed mobile app that functions superb, you can get a leading edge and create your monopoly in the tourism market. Travel apps can be linked to geo location-enabled services like Google Maps and GPS to provide maps, directions and even last minute route diversions to unfamiliar locations. To facilitate easy navigation a new app called Triposo, which connects to your Smart phone via Wifi/Blue tooth and helps you to locate tourist attractions. Airbnb, the world’s largest accommodation booking website allows people to review rentals and home stays anywhere on the globe through videos and pictures. To make your trips more planned, travel apps now provide information on weather forecasts and t the traveller on upcoming climate changes. An app called WeatherPro, offers high-quality, detailed information on weather conditions. Travel and tourism sector have immeasurable opportunities, with the advancement of technology, particularly the mobile app development, it is reaching for new horizons each day. Mobile apps are proving vital for all sorts of businesses and so would work well in this industry too. No matter how sophisticated technology is, it can never replace the human factor and interactions. Technologies can be a critical component in tourism business for obtaining a competitive advantage. A well planned, user friendly travel app can definitely help boost your travel business. We thought it would be terminators, or rogue agents (Agent Smith) who would take over the world. But, it’s mobile apps that have taken over the world. What’s more – they are not half as menacing as sci-fi movies made us believe. Looking at the success stories of apps such as Prisma, Snapchat, etc.. it might be enticing to jump into the app development playground. But there is a horde of questions to be answered before you even touch the drawing board. Answers to a few questions you have in your mind regarding the business viability and implementation of your app. You might even want to know the basics of app development. As you read on, you would be able to know about all these. Also, if there are more aspects you would like to know about, you can let us know in the comment section. 1. Is there a market for your app? Is there really a demand for the kind of app you want to develop? If you have an idea for a possibly ground-breaking iPhone app then a quick search through tools like Apptrace or Appstatistics will tell you if there are any established competitors in the market. If you do not find any noteworthy competitors then you are probably in murky waters as far as your target market is concerned. 2. What is the launch plan for your app? App development is only half the job and is the easiest part of your goal. Today, to establish your iPhone app in the market you need a concrete social media marketing strategy. Locating possible users and reaching out to them is a sure-shot way of getting the first few 100 downloads from the App Store. If you plan to market through Facebook or other online mediums you need to know the user persona, which brings us to our next question. 3. What is your app’s target user profile? A user profile is a detailed analysis of the behaviour patterns, gender and preferences and it dictates how users will behave inside your app. Your iPhone app development strategy should reflect this profile so that the outcome is a product that is desired by your chosen demographic subset. 4. Monetization strategy for the app? 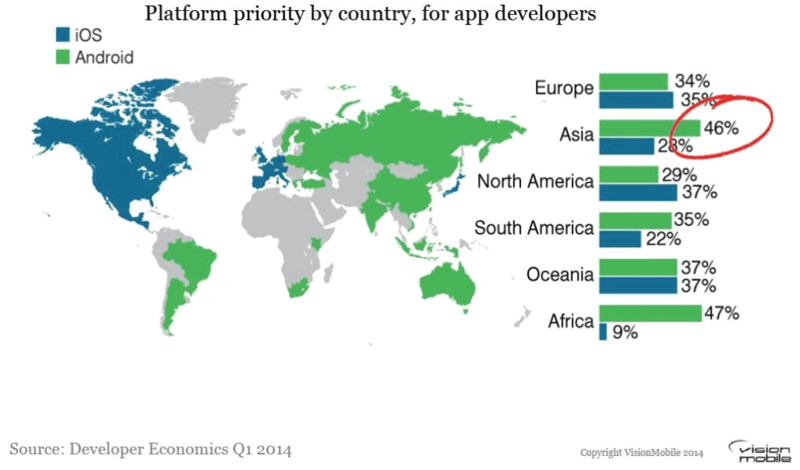 Less than one percent of all developed iPhone apps are profitable. Even if your app is available for free you should have a strategy to monetize it by other means in the long term. Including add-on features or “unlockables” are some ways of doing this. Advertising is the most commonly used technique for earning revenue from the App Store. 5. Are you familiar with App Store’s guidelines? 6. Why do you want an app? This is probably the most important question of all and should be visited regularly. A great idea and good programming skills are not strong reasons to build an app. Without a marketing strategy and a target market analysis you don’t have enough resources to justify developing an app. Sure, an app will build your brand’s recognition and customer engagement and might even generate additional sales but all that will happen only after an app is developed for the right purpose keeping the correct goals in mind. Should I Choose iOS Or Android App Development? There comes a time in every app entrepreneur’s life when a choice has to be made between developing on one platform or another. Like anything in life, Android and iPhone development have their pros and cons and at times the decision to choose between them can be so difficult that the real loser would be the app entrepreneur. A common point of debate is that Android is highly accessible and developing an Android app offers good market penetration. iPhone apps, on the other hand have been around for much longer than Android and Apple has used data collected over more than a decade to define industry-changing guidelines regarding user experience. So the obvious question is: why not develop on both platforms? For starters, it isn’t as simple as copy-pasting code from Android to iPhone or vice versa. There are several design guidelines and coding principles which inhibit the easy development of cross-platform apps. Here is a comparison between Android and iPhone app development for those of you who are trying to decide which platform to use for your app. We have developed a comparison based on commonly debated points when developing any mobile app whether Android or iPhone. This list should help you decide which of the two platforms would be more suitable for your mobile app. To begin Android or iPhone app development you need the Integrated Development Environment (IDE) for both platforms – Xcode for iPhone and Android Studio for Android. Xcode has dependencies on some other programs such as Cocoa Touch, which assists in building UI elements. 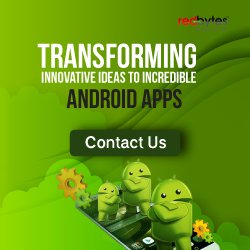 One factor which differentiates Android and iPhone apps is the development time. A study done by Infinum on six of their own cross-platform apps shows that development time for Android apps is, on average, 30 percent longer than iPhone apps. This is partly due to the fact that Android apps require more code because they use Java and also because Android emulators are slower than iOS simulators. As a direct consequence of higher development times, development costs for Android apps are also higher – almost 40 percent higher than iPhone apps. 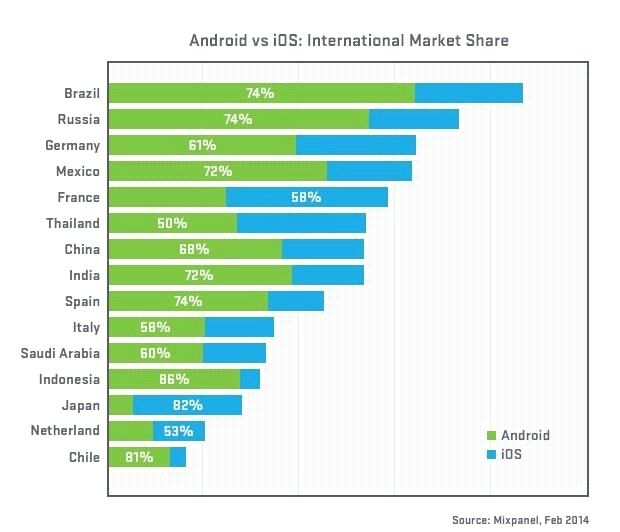 Android’s large market share has a drawback: its users are spread over several countries and each demographic has its own income levels, technology restrictions and language barriers. This translates into limited availability of high-end smart phones in second and third world countries. If you develop an Android app then you have to cater to varying hardware and software, screen resolutions, aspect ratios, graphics processors and a host of other factors. Adding to the problem is the fact that more than 70 percent of Android users don’t have the latest version of the operating system. Taking care to ensure compatibility across multiple devices is an entire project in itself and this is a major reason for the higher development time and cost of Android apps. 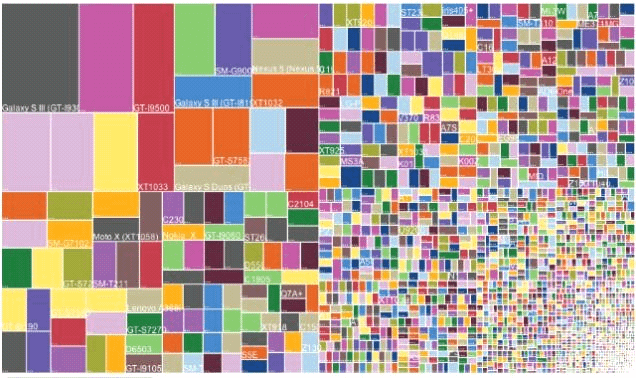 Future support and updates are also equally affected by fragmentation. Apple products on the other hand are largely immune to this problem. Only 3 types of Apple devices exist – Mac, iPhone and iPad. iOS users are also quick to upgrade to the latest version. More than 80 percent of iOS devices run the latest operating system. Apple has strict guidelines when it comes to what an app can and cannot do. iOS and Android provide similar levels of flexibility with firmware components but Apple is much more stringent while checking apps submitted to the App Store. Android offers access to a lot of internal workings which allows the creation of popular utility and customization apps. When it comes to publishing, Apple’s App Store is tricky to deal with. First of all, an annual fee of $99 is incurred so that your apps can be tested before they are published. Apple thoroughly checks the app for originality, content and design and conducts tests for bugs and crashes over a period of seven days. Even after this there is a good chance that your app may be rejected. Google’s Play Store is very straight forward – it requires a one-time payment of $25 and your app can be live within a few hours of submission. App Store’s guidelines help to ensure uniformity and good quality but we feel that Play Store’s flexible guidelines promote more creativity. 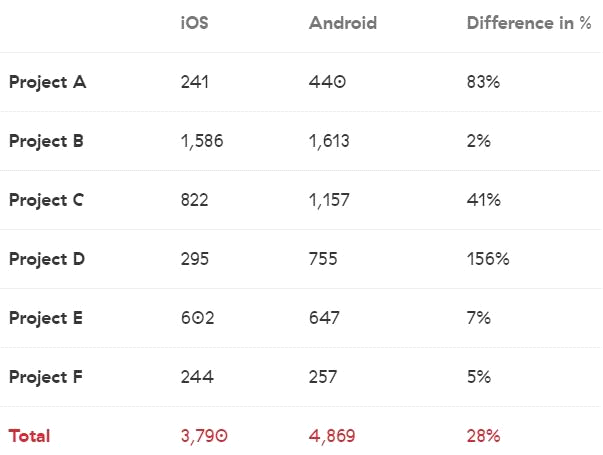 Undoubtedly, there are many more smartphones running Android than iOS but the following report from App Annie shows that iPhone apps bring in almost 75 percent more revenue than Android apps. This can be attributed to the fact that iPhone users are generally situated in developed countries andare highly educated and have higher incomes than Android users. The average iPhone user makes $85,000 per year whereas the average Android user makes $61,000 per year. This does not mean that Android users are poor, it only implies that iPhone users are more willing to spend money on apps than Android users. Before you develop an Android or iPhone app, ask yourself: is your app going to be popular among people in developed nations or will it appeal to countries in, for example, South-East Asia. The prevalence of Android in second and third world countries means that apps targeted towards Android users are sure to be successful. This does not mean that iPhone apps will not work; rather they will not be as popular as the Android version of your app simply because not many people use iPhones in these countries. Assess Your Intended User Experience Regardless of functionality or complexity or even usability, an app that offers good user experience has much higher chances of being a success than an app that is well coded and well designed but offers poor user experience. Apple has more than a decade of experience in UX design – the iTunes library has been operational since 2000 and ever since it was opened, customers have used it to buy music. The data and statistics from the iTunes Library were carried over to the App Store in 2008 and resulted in an online marketplace which was easy to navigate and apps which offered consistent user experience. Apple was also ahead of its time in coding complex algorithms for ranking apps – they were ranked based on total downloads, recent download volumes, and possibly active users among many other factors. Can a Mobile App Development Company in India Produce Quality Apps? Play Store’s user experience has been catching up steadily but is nowhere near as good as Apple’s. The availability of multiple stores like Google Play, Amazon App Store and other independent stores has caused an inconsistency in rankings, reviews and even app designs – this has affected the user experience of Android apps on the whole. We recommend that UX design should be near the top of your list of priorities when developing a new app. No matter which platform you decide to use for your app, keep in mind that developing an Android or iPhone app is more than just writing code – it involves designing, coding the UI, user experience design, and documentation. All of these have to be linked and well coordinated to achieve a good mobile app. As every coin has its two sides. Hiring a freelancer over an App Development company may result in a decrease in costs but may certainly increase in risks. A freelancer can clearly not meet all the needs nor can fill in all the roles. 1) Expertise under one roof: An app development company will have a workforce with various talents than a freelancer who cannot possibly be good in all fields. A company will have the experience and expertise working with a multitude of clients. They can also offer everything that requires a top-level mobile app right from the concept to market launch. 2) Design and Development: Giving out the perfect design with the right functions is undoubtedly the hardest challenge in any app project. Designers and developers work together to deliver the best-in-class results in the quickest time within a company than a freelancer. But even if you somehow manage to find a freelancer, and fail to find the equivalent level of expertise on the design side, your project may not yield a viable end product. 3) Client support: A company would have a dedicated network of customer support staff which can help you in all queries. They would also provide various post launch services to its clients. However, a freelancer may not be able to provide any such services as they are operating alone. 4) Communication matters: With different professionals handling different departments, a firm has a better organizational structure. They can provide you with real-time updates and timely solutions to all your problems. This helps you to collaborate on your project easily. 5) Project Estimate: Another factor to consider is that a firm may be more willing to enter into a fixed-price contract compared to a freelancer. Agencies’ collective experience makes them better at accurately estimating the costs of all stages of your project from the beginning. As they may cost more, there should be less chance of cost overruns in the project. The above features will definitely help you in knowing and understanding why to hire app development companies over freelancers. It has become extremely challenging to build a mobile app and announcing it as a success in this competitive market. Hence, it’s recommended to keep your end-users in mind before choosing a company or a freelancer to start your app creation journey! The mobile era is upon us. According to Gartner Inc., the market demand for mobile app development services will grow at least five times faster by the end of 2017. Following this trend, mobile app development companies in India have seen booming business in the last five years. If you have an idea for a mobile app then now is the time to unleash it and increase the reach of your brand. If your budget permits, you should hire a mobile app development company to create your dream app. A specialised workforce, detailed documentation,and dedicated post-launch support are just some of the benefits of working with a professional organisation. However, selecting the correct organisation is critical to the success of your mobile app and given the market saturation of mobile app development companies in India; this is a painstaking choice to make. We understand this and have compiled a list of pointers to help you select the correct company for developing your app. 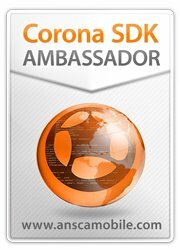 What do you want to accomplish by developing the app? What features will your app provide to customers? How will the app relate to your brand or business? How will you monetize the app? Adding tons of features to your app is one thing, but having the budget to develop those features is a completely different matter. There are no definitive rules for deriving the “cost per feature” so the best way to determine your budget is to talk with an expert. Small mobile app development companies in India will work with lower budgets but the chances poor quality or missed deadlines will be high. Larger companies will be able to offer more consistent quality, but at higher prices. As a general rule, app quality is proportional to your budget, however the quality difference between a $100,000 and a $200,000 company is less than the difference between a $10,000 and a $50,000 company. RFP is a Request For Proposal which is sent to mobile app development companies. It outlines the requirements of your app and all the features it would need. A company will typically analyze your RFP and come up with a brief document describing how they would tackle the project and approximate costs of various modules. RFP will also help you with short listing companies as well as getting a different perspective on t the features in your app. After receiving costing quotes from different vendors you should have a good idea about which ones you can work with. To further narrow down the list, you should request a client portfolio from each company. Many companies display a list of their most recent or most notable clients on their website. Contact the clients to learn about the quality of work, communication and adherence to deadlines. While this is a good way to gain a deeper understanding of the company, keep in mind that companies will not share information about clients who had bad experiences with them. Where Is The Operations/Development Team Located? If you are constrained by a small budget then you may have to opt for smaller mobile app development companies but, one thing to keep in mind is the location of the organisation’s operations /development team. Some companies are not very transparent and outsource your app’s development work to freelancer. If this happens then the standard of work will be inconsistent and unreliable since the company has no control over their resources. Tip: Look for a company that has its own resources for coding, UI, UX, quality, and testing. Documentation is one of the most under-rated and overlooked modules while developing a mobile app in India. A well documented project has better chances of being rolled out on time because all the requirements are clear from the start. Post-launch support is also simplified because all the required information is in one place. If the shortlisted companies don’t give emphasis to proper documentation procedures then you can safely rule them out of the picture. Post-launch support is very important to the success of an app. Many apps fail after being launched because customer feedback could not be used to modify existing features or add new ones. Hire a mobile app development company which has experience in your line of business and is ready to sign a long-term contract.a strong and long relationship with an organisation will pay off in the long run. 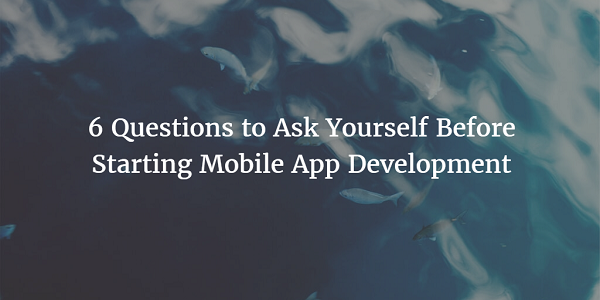 Tip: Unlike freelancers, mobile app development companies can take the leading role in shaping your app. The abundance of specialised employees means that good advice is always available. With the pointers we have listed, you should be able to find a mobile app development company in India suited to your business. There are several advantages of distributing your work but the task of choosing between a development company and a freelance developer is cumbersome and requires careful analysis. Budding entrepreneurs and inexperienced companies have a short period of time to establish their name in the market and the results of a poorly chosen developer can be potentially catastrophic. If you are cash strapped then a freelance developer or a group of freelancers might be your best bet. However, a small budget isn’t the only advantage when it comes to freelance developers. Here are some more reasons to choose a freelance developer over a mobile app development company in India. Freelancers have experience from multiple industries. Good freelance developers look for work which adds value to their portfolio and in order to do this, they find work from multiple industries. When you hire a freelance developer you get the advantage of expert opinion gathered from many sources over several years of freelancing. Freelancers reduce the cost of your project. It goes without saying that you do not need to pay for a freelance developer’s Provident Fund or medical insurance. The employees of a development company, on the other hand, require these benefits. Minor costs like these increase the overheads which you will incur when hiring a mobile development company in India. Another factor which reduces cost is that there is no notice period or transition period when terminating a contract with a freelance developer. Freelancers don’t organize endless meetings.a freelance developer can avoid the hassle of setting up meetings and juggling schedules of the employees in a development company. With freelance developers, you can assign a quantum of work and check on progress occasionally as opposed to weekly meetings with development companies. The time saved in this way can be invested in other app related activities such as marketing and branding. Freelancers don’t have rigid corporate rules to adhere to. Freelance developers come with the added flexibility of not being restricted by a brand manual or a set of corporate ethics. They are not confined to any regulations except their own and this is more often than not to your advantage. Many freelance developers will put in a few hours of work on weekends as well – something almost unheard of in the corporate world. Freelancers don’t engage in office politics. If you work in a small-scale mobile app development company then this may not seem like a very important point but if you are an executive in a corporate company, you have probably experienced how office politics can delay projects and be detrimental to productivity. A freelance developer, no matter how senior or experienced, is not directly involved with the employees of your company and is not limited by personal agendas that employees of your organization may have. Freelancers like direct forms of communication. A mobile development company in India or anywhere in the world has a well defined hierarchy of individuals and communication will always flow to and fro along that hierarchy. Admittedly, this has its advantage in filtering information passed on to third parties but it also increases the time it takes for a point to be put across. Freelance developers can communicate directly and no time is lost in relaying information to and from both parties. Given the large number of freelance developers out there, many points have to be considered before you hire the right person for the job. If you are new to the freelance outsourcing world then the road will be rough but eventually you will find that working with freelance developers can be very cost effective and time saving while ensuring good quality. A lot can happen between the planning and execution of your mobile app idea but the one thing that can make or break your app venture is choosing the right developer. A more lucrative option is to choose a freelance developer but here’s the flip side – an incorrect choice can turn out to be very expensive in the long run. Choosing the correct freelance developer for your app venture involves more than just finding good skills and low prices. A lot of factors go into deciding who to hire so we have put together a list of things you should consider before getting started. Compounding the problem of choosing the right developer is the fact that a lot of the applicants are likely to be inexperienced, inefficient, or both. Many new comers bulk apply for jobs without bothering to read the requirements of different projects. There is a very clever way of filtering spammers: include a small paragraph at the end or in the middle of your listing and write something like, “If you have read all of the requirements then send me a message that begins with the words mobile app development in India” or something on these lines. If an applicant fails to follow simple directions and doesn’t pay attention to detail, you can safely filter them out. Nothing can harm your mobile app venture more than poor communication with your developer. If you can’t communicate ideas clearly then a lot of time will be spent in rework which will eventually drive up the cost of your mobile app venture. To get over this problem, establish a means of communication with your candidates – Skype, email or phone call – and interview them while requesting them to share their portfolios. Ideally, you should look for a developer who has created apps similar to what you have in mind although this is not a hard and fast rule. Game developers can also create applications. One of the best places to look for freelance developers is a college. This may sound counter-intuitive because educational institutions can hardly offer experienced candidates but chances are that you will find standout developers in the multitude of students. Good colleges are hotspots for mobile app development companies in India because of the fresh talent they offer. Colleges teach students to think creatively so even if you don’t end up with a developer, you will get several valuable insights into your own app from a lot of different perspectives. The success of an app can often come down to the developer’s interest in the business or idea you are projecting. Mobile app development companies in India have employees with specialisations in different fields so finding the right person for the job is not difficult. But if you are hiring a freelance developer for your app venture then you need to go the extra mile to ensure the correct fit between your business and the developer’s profile. An interested developer is likely to give creative inputs and insights from experience with similar apps. A free-thinking developer is much more valuable than a skilled coder. Tip: a lot of apps need support even after being launched so it is a good idea to hire someone who is ready for a long term contract rather than just the development of your app. Many freelancers have been known to copy-paste stock code obtained from public websites like Android or iPhone forums. In order to catch this, you need to ask your candidates for sample codes and get them reviewed by your contacts or at an online portal. While this doesn’t guarantee that a good app will be developed, it does guarantee originality and imagination. By now your list should be quite short and choosing your developer won’t be very difficult. This final test should help you select the final few who are fit for the job. Just like the websites of mobile app development companies in India, freelance developers should give you a brief introduction to apps that they have worked on. A credible freelance developer should readily give you information about their previous work, including the contact details of their clients. Average rating of the app. Reviews of the app – also check negative reviews. Is the app quick to load? How smooth are page interactions? Check the resolution and aspect ratio on different devices. How pleased are you with the UI/UX? By the time you are done with this list we hope that you have narrowed your search down to a few candidates. From there on it should only be a matter of negotiating prices and signing contracts. Play your cards right and you will bag a good developer at a good price. Instead of hiring a freelancer or a mobile app development company, you might want to build an app on your own. Or, at least to know the intricate nature of app development just for the sake of better management. In that case, there are numerous online resources available for you. Mobile app development is based on the principles of traditional programming languages like C and Java so people who have prior programming knowledge find that app development is easy to understand. On the contrary, new tools like Apple’s Swift programming language are gaining popularity rapidly because of their gradual learning curve and ease of use. Non-technical folks have no reason to lose heart because the popularity of mobile app development means that there is no shortage of paid as well as free courses which impart knowledge about basic programming as well as advanced concepts. If you’re hoping to add value to a mobile app development company in India, you’re just a few clicks away from in-demand skills. To help you get started with mobile app development in India, we have compiled a list of online resources which will aid beginners on their way to becoming mobile app programming gurus. The nature of mobile app development is such that basics can be mastered very quickly and once you are comfortable with developing apps like flashlights and small games, bigger goals can be achieved steadily. Developer.android.com.Android is among the top two most popular mobile app programming platforms so the first place you should check is Android’s own website. It is one of the best resources out there when it comes to the how-to of Android development. The employees at Google have ensured that there is a lot of material for beginners to learn everything from setting up development environments to cloud-based services. Alison. Alison is another great website which offers tutorials and certified diploma courses in a vast variety of domains from business skills to programming languages. The app development tutorials have good and consistent ratings and courses for both Android and iOS are available. For example, in order to explain iOS app development, the website first teaches Objective C and then explains how it is used to develop iOS apps. Advanced material includes learning to use multi-touch functionalities as well as the accelerometer. Learning Tree. Learning tree is an extensive website and it offers courses in a range of subjects from web development and mobile app development to advanced programming techniques. Android as well as iOS development techniques are covered and an introduction to Swift programming language is also available. Swift is largely becoming a popular choice among iOS app developers so we highly recommend learning it from this website. Vogella. Vogella provides a wide variety of free Android tutorials for coders of all skill levels. The tutorials are detailed and arranged in a tree format so that individual topics can be found under their corresponding headings. Each tutorial is indexed so it becomes easy for you to navigate directly to your choice of topic. The website also gives links to external resources wherever needed. Coursera. Coursera offers tried and tested tutorials for both Android as well iOS app development. It covers topics like user-facing applications, middleware and cloud-based services. The courses are paid as well as free depending on their complexity and duration. The only drawback is that you do not get a certificate for completing the course unlike some other websites. Stack Overflow. Stack Overflow is an open, free, and language-independent question and answer website for programmers. It features several forums where topics about beginner to expert level programming are discussed. Although it does not offer tutorials, its wide selection of extensively discussed topics ensure that any and all questions you may have are answered. We hope this list helps you find the resources you are looking for to build your own app or to get started with mobile app development. It is an exciting and competitive field so be sure to give it your best shot. If you use apps or know about android app development or iPhone app development, then you have definitely viewed or heard of app preview videos. Google and Apple app stores are maxing out at almost 2 million apps each and new apps stand out because they infuse bright colours with bold designs or simply because they are developed by reputed organizations. In a sea of developers and designers, each with their own unique ideas, mobile app preview videos help your product stand apart from the crowd. How to Make Your Apps Attractive? What an app preview video does is it increases the chances of your iPhone or Android app being downloaded and it does this by simply allowing prospective users to take a look at what your app offers and how it works. We can tell you off-hand that a paid app has a higher chance of being downloaded if buyers can preview what your app does before investing their money. App stores are the battleground where iPhone and Android apps compete for downloads regardless of the effort that has went into android app development or iPhone app development, budgets or marketing strategies. The best apps as well as the obscure ones are given equal opportunities to strut their stuff in elaborate app descriptions, screenshots, ratings and reviews. The only thing standing between your app and a million downloads are the users. Unfortunately, users are lazy. Studies have shown that more than 60 percent of iPhone or Android app store visitors don’t even look at the two most effective means of describing what an app does – screenshots and descriptions. This means that 60 percent of prospective users won’t even bother to check what your app does. App preview videos are the next best thing in these situations because almost everyone will tap a play button instead of scrolling through text. StoreMaven reports that adding preview videos increases conversions by 20 percent for App Store and 35 percent for Play Store. 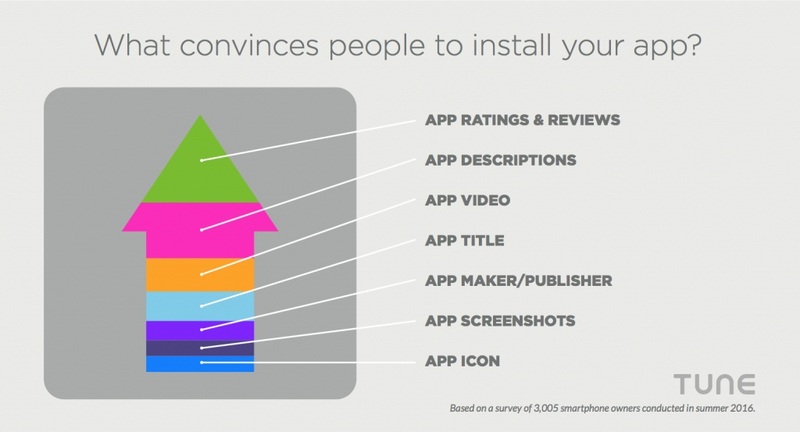 In other words, people are more likely to download your app if they watch a video of it first. 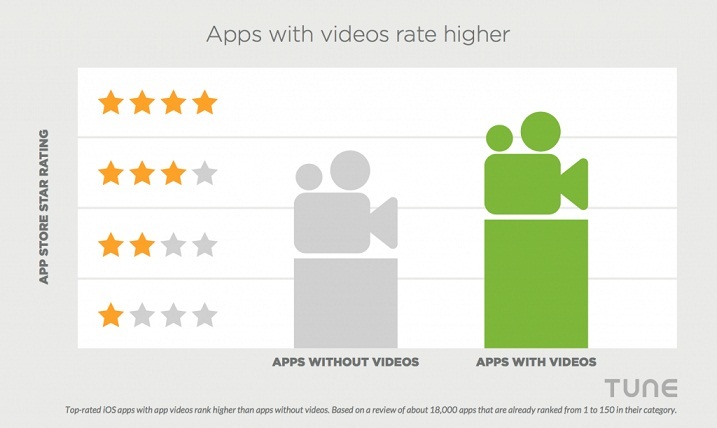 Did you know that app preview videos can affect the ratings of your app? Tune conducted a survey which revealed that apps with preview videos were generally given a higher rating than apps without them. The average rating for apps without a preview video is 3.81 stars, almost half a star lower than the average rating for apps with a video: 4.24 stars. In App Store and Play Store, higher ratings help new apps move up in app rankings and app rank is the default sorting filter applied in both stores when people are browsing. Newly released apps don’t have a tonne of reviews which prospective users can read so unless there are other pointers, like preview videos, users will classify the app as suspicious and move on to other options. If you have spent your time, effort and money for android app development or iPhone app development, then you want it to have higher ratings. Almost 60 percent of the ratings are achieved through app descriptions and user reviews but where can you find that extra edge to push your app in front of the competition? 40 percent of smartphone users consider app preview videos among the top three deciding factors for a download. 1. It engages users more directly than text or screenshots. 2. Videos are easy to share and have the potential to become viral, unlike text. 3. Users prefer watching videos to scrolling and reading. 4. Videos communicate ideas more clearly and effectively in very little time. 5. It provides a demo of your app so users know what to expect. So if you are confident that your iPhone or Android app is sure to hit the top-10 list, give the users a preview of your app because if there’s one thing we know, it’s that people like to tap play buttons on their smartphone screens. Now that you know why app preview videos are important, let’s get on with understanding how to make them and ensure the efforts of your android app development or iPhone app development team doesn’t get wasted. 1. Define a script. On Apple’s App Store your preview video has 30 seconds to tell users about your app and convey its usefulness. While Google’s Play Store does not have a time limit, studies show that the average viewer will look at a video for two minutes before moving on. This sort of constraint implies that you need to brainstorm ideas to highlight the most compelling features of your app and write a script which will effectively showcase each of them. Unlike Play Store, App Store does not allow localisation of videos. This means that for an iPhone app, the same preview video is viewed all over the world so including text or narration is not the best idea since you are limited to one language. 2. Capture the video. Apple’s app preview guidelines state that absolutely no real-world footage should be included in the video, unless you have developed a camera app. Your preview video should contain only animation and in-app features. We suggest using expanding dots to convey taps and moving arrows for gestures. Of course, if your app works on only one or a few screens, a preview video won’t really get you anywhere. Play Store, on the other hand, provides a set of loose guidelines/suggestions which, if followed, will ensure that your preview video effectively communicates the usability of your Android or iPhone app. 3. Add music. Including a sound track in your preview video will make it livelier but, for legal and moral reasons, you are limited to using audio tracks for which you have acquired licensing rights. Let’s just say Beethoven wouldn’t like his compositions to be used in an app without his knowledge. For this reason, several app developers source audio from SoundCloud and look for royalty-free tracks. If you are showcasing your Android or iPhone app being used then it is a good idea to include the UI sound effects to give a sense of continuity to viewers. 4. Format your video. Apple’s guidelines are very particular when it comes to preview video resolution, file type and even pixel shape. Your video has to be shot at the native resolution of devices on which it will be viewed. This means that for iPhone 6 users your video should have a resolution of 750 x 1334 and for iPhone 6 Plus: 1080 x 1920, any other resolution and your video is rejected. A tool called FFMPEG will help you easily reformat preview videos. 5. Upload your video. Play Store allows you to link promo videos from YouTube so post your preview video on YouTube and then link to it. Be sure to make the video Play Store specific, for example – don’t include an end slide that says “Download from App Store and Google Play”. App Store is more specific when it comes to preview videos – you need to upload the video using Safari, Apple’s web browser. Apple rejects videos which have non-square pixels but luckily, there are several online tools which will convert your video into a square-pixel format. So, you are armed with valuable video making knowledge. You can go ahead and make an app preview video that will make your Android/iPhone app shine brighter than the competition! Do you have experience creating an app preview video? We would love to hear from you in the comments section below. Redbytes Software pvt. ltd. is proud to announce that our sister alliance has has released a revolutionary MOBILE FIRST approached based Online Food Ordering System, eDeliveryApp. This system is built as a complete turnkey solution for restaurant business owner and multi-restaurant food delivery businesses. eDeliveryApp builds amazing restaurant menu for both mobile and desktop. It can also be used out of box for businesses that do local delivery like grocery, bakery, cake-shops, flower shops etc. The system is recommended for food delivery start-ups aggregators and restaurant owners who are looking to setup a complete system which is cost effective but is wholesome and top quality and can be extended to !ap with their specific business requirement. The system consists of Website, Android App, iOSApp and admin panel. There are multiple modules to extend the systems functionality like Facebook app, location based search for multi-restaurant aggregators, preordering, pizza builder and combinations, delivery driver assignment, custom restaurant menu builder etc. The system is built on modular architecture to provide core value to our buyers. The primary system has all the main online ordering system and delivery features, all the additional features are built as modules. This way our buyers do not have to pay for additional features they do not need and pay only for the features they need. Flexible Design – we have main theme that can be customized in multiple ways. We also provide custom designs – you can provide psd or show us a website or template/theme that you want your system similar to. Menu – you can add multiple categories and child/sub categories. Display dishes in traditional menu format or grid/list view. Add details of the dish like nutrition value of ingredients etc. In the menu. We also have traditional restaurant menu layout. Social and regular account creation. Add to favorites and share with friends. You can integrate your own payment gateway or simply go with Cash on delivery. Locate your shop on Google maps. Mobile Applications – What Will Their Future Be Like? Android and iOS Apps – Built on native platform, our app is designed to use your smart phones native features optimally. No hybrid or cross platform apps give you this power. The mobile apps have all the features of the website. The restaurant menu layout is mobile optimized. Admin Panel – The admin panel is easy to use yet wholesome. You can add/edit/delete literally all the data of your system with our custom restaurant menu builder and CMS helps you manage the content on your own. If you are looking for an online ordering system do reach out to us.